Cnoc na dTobar is 690 metres high and situated 4.5 kilometres from Cahersiveen town in the south west Skellig Kerry region. It has been a sacred pilgrim site since prehistoric and medieval times. The mountain was also an important mountain in Pagan Ireland, long before Christianity arrived. Cnoc na dTobar was the site of ancient mountain assemblies, especially the festival of Lughnasa, where harvest was celebrated on the mountain’s summit. A fire was lit and singing and dancing competitions were held. In 1885, Canon Brosnan, parish priest in Cahersiveen and builder of the Daniel O’ Connell Memorial Church, decided to build fourteen stations of the cross along the mountain’s ancient trail. It is one of Ireland’s premier sacred mountains, similar to Croagh Patrick and Mount Brandon. It is also the most recent addition to the Pilgrim Paths of Ireland, one of just twelve pilgrim trails to be selected in the country. At the base of the mountain there is a well dedicated to St. Fursey or St. Fursa, the sixthcentury saint, which is known for its healing mineral properties, especially for eye problems. As one climbs the mountain, the iconic Skellig rocks gradually appear. The trail is clearly marked and people of all ages can walk some or all of the path. 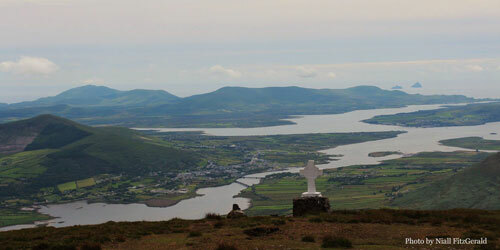 The views are impressive, offering scenes across the Kerry mountains, Dingle Bay and West Cork. No dogs are allowed on this Pilgrim Trail. Sturdy walking boots / shoes, warm clothes and rain gear required. There is a car park located at the foot of the mountain. The entrance to the path is at this car park.